It was so fun to have Melodie as one of our brides this past fall. We actually met Melodie through Alta Moda Bridal, where Melodie works part time, before she came to meet with us for her invitations. 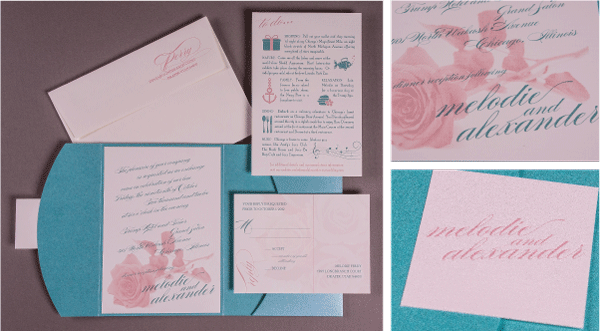 Melodie is a sweet bride who dreamed of her invitations resembling a Tiffany’s jewelry box. You know… the iconic blue box tied with a white satin ribbon. We were excited about the prospect of developing a Tiffany’s inspired invitation for Melodie’s dream wedding in Chicago. Keep reading to find out more about her invitations and her romantic wedding. Ruth: When you came to us you had an idea for your invitations to resemble a Tiffany’s box. How did you come up with the idea? Melodie: I’ve always loved anything that came in a Tiffany’s box. Alex would always get me presents from there and it was kind of our thing that if it is something really special it was in a Tiffany’s box. 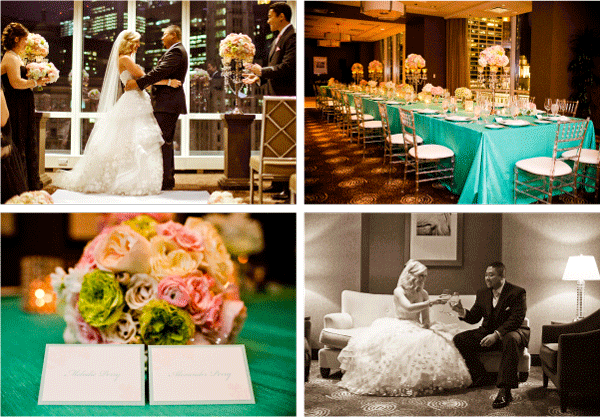 That is how I picked the colors for my wedding by using Tiffany blue and pops of pink. I had to add the pink because it’s my favorite color. Ruth: Was there an element like the pocket that made you think “yes, that’s it!”? Melodie: I thought he would say “whatever you want” and wouldn’t be that interested in the invitations. But then when we received the Pinterest board that you created for our inspiration he had a lot of interesting feedback of what type of graphics he preferred. It was surprising to me that he wanted to be involved but it was really fun to do together. Melodie: Listen to your instincts and if you’re drawn to a certain thing you don’t have to try and explain it. Just say, “I like this and it’s great”. Go with your instincts and you’ll always be happy in the end! I think mainly don’t be afraid to ask questions and any ideas you have just throw them out there. Also give yourself plenty of time and make sure you proofread, even have others proofread it as well so everything is correct. Melodie: The Tiffany blue color went all through the wedding. Also, my menu designer in Chicago was able to match the colors of the menu up to the colors of the invitations. The colors were also used for the flowers and we used ribbon to tie around the centerpieces keeping the Tiffany’s box theme. Melodie: Hire a wedding planner that is local to the area you’re getting married in because they have a lot more experience with the vendors. I think anyone can make things look great on a website so I was really grateful for our planner who gave me honest feedback and we loved ever vendors she recommended so it was a great relationship! Ruth: Thank you so much for coming in to talk to us about your wedding and the invitation process. We we’re also honored that you trusted us to create your Tiffany’s inspired invitations. You’re such a pleasure to work with and we wish you the best!